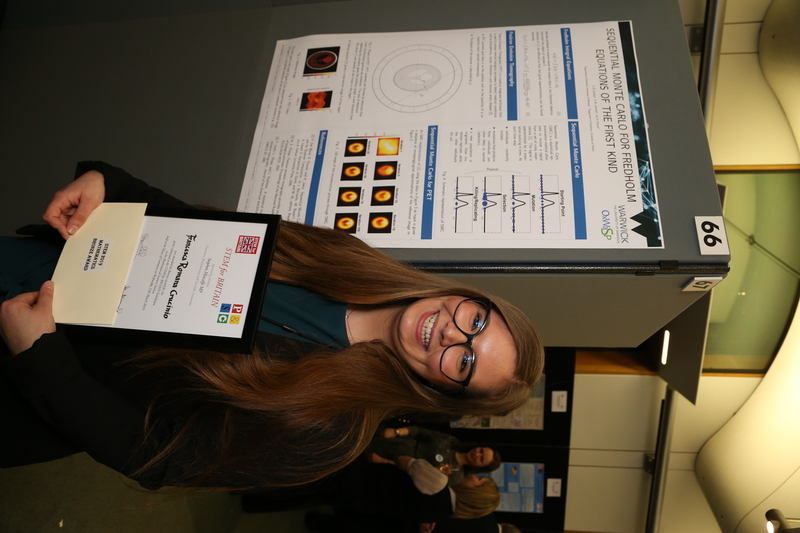 Francesca Crucinio, a researcher from the Department of Statistics at the University of Warwick struck Bronze at a competition in the House of Commons, for the excellence of her mathematical research, walking away with the £750 Bronze prize. 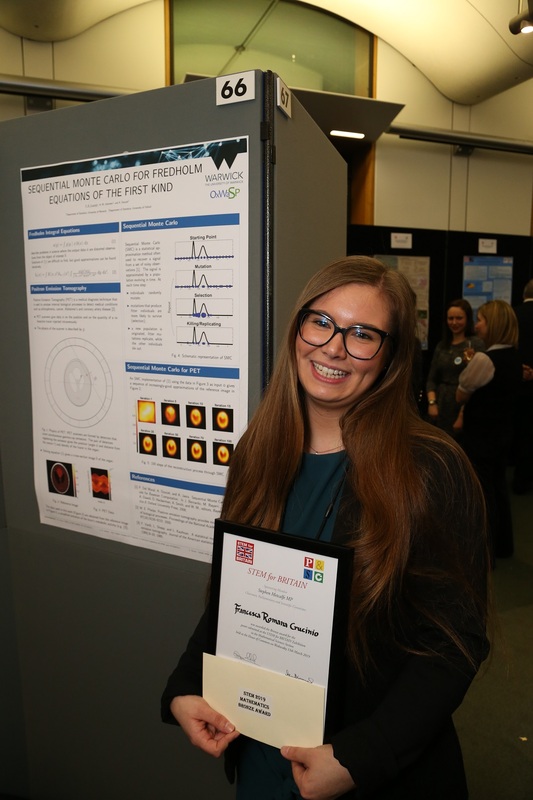 Francesca presented her research to dozens of politicians and a panel of expert judges, as part of the poster competition STEM for BRITAIN, on Wednesday 13 March. Professor Jon Keating FRS, Chair of the Heilbronn Institute for Mathematical Research, supporters of the Bronze Award said: ‘As a Research Institute whose focus is on fundamental mathematics and its applications to UK national interests, and on supporting mathematical research across the country, HIMR is delighted to be associated with STEM for BRITAIN and offers its warmest congratulations to all of the Award winners’. Sir Ian Diamond, Chair of the Council for the Mathematical Sciences (CMS), said: ‘The CMS is delighted that the mathematical sciences have been involved in this prestigious event once again, it is wonderful to showcase the importance of the mathematical sciences to a wider audience. It is paramount to encourage early-career research scientists, engineers, technologists and mathematicians and the STEM for BRITAIN event is a very effective way of doing this. We have been encouraged by the enthusiastic response from early-career researchers in the mathematical sciences and feel sure this will this continue in the future’. The Parliamentary and Scientific Committee runs the event in collaboration with the Council for the Mathematical Sciences, the Institute of Physics, The Physiological Society, the Royal Academy of Engineering, the Royal Society of Biology and the Royal Society of Chemistry; with financial support from Research Councils UK, Warwick Manufacturing Group, the Clay Mathematics Institute, the Heilbronn Institute for Mathematical Research, the Nutrition Society, the Institute of Biomedical Science, the Comino Foundation and the Society of Chemical Industry. 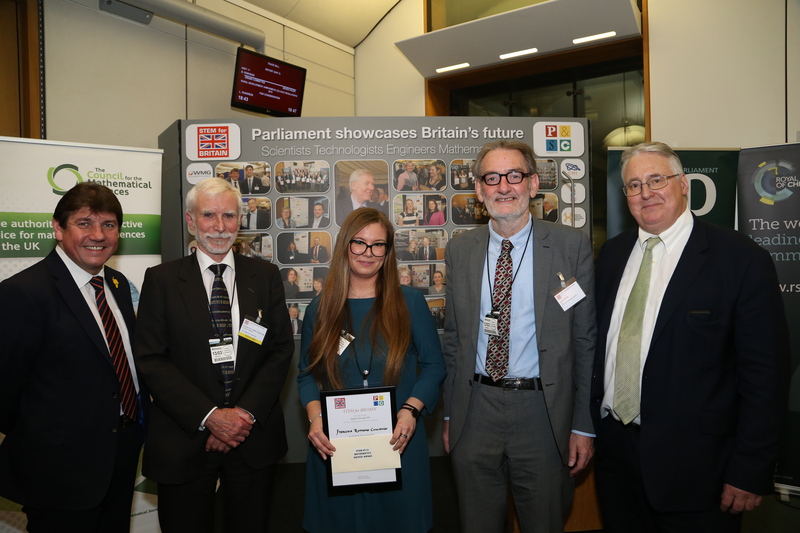 STEM for BRITAIN (formerly SET for Britain) is a poster competition in the House of Commons - involving approximately 180 early stage or early career researchers - judged by professional and academic experts. All presenters are entered into either the engineering, the biological and biomedical sciences, the physical sciences (chemistry), the physical sciences (physics), or the mathematics session, depending on the researcher’s specialism. Each session will result in the reward of Bronze, Silver and Gold certificates. Bronze winners will receive a £750 prize; Silver, £1,250; and Gold, £2,000 and a medal. There will also be an overall winner from the five sessions who will receive the Westminster Wharton Medal. SET for Britain was established by Dr Eric Wharton in 1997. Following his untimely death in 2007, the Parliamentary and Scientific Committee, with support from the Institute of Physics, The Physiological Society, the Royal Academy of Engineering, the Royal Society of Biology, the Royal Society of Chemistry and the Council for the Mathematical Sciences, is working to further his legacy. The event is made possible this year with financial support from Research Councils UK, Warwick Manufacturing Group, the Clay Mathematics Institute, the Heilbronn Institute for Mathematical Research, the Nutrition Society, the Institute of Biomedical Science, the Comino Foundation and the Society of Chemical Industry.